Amanda Downing, chef at Chicago’s Rockit Bar & Grill, creates the ultimate potato casserole that can double as a main course. 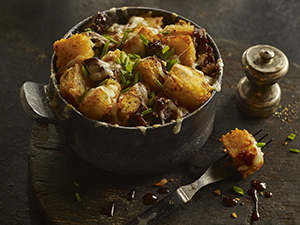 It starts with made-from-scratch potato tots that are layered with beer-braised beef, Gruyere cheese, pearl onions and fresh mushrooms. It’s a hearty dish for a cold winter night. 1. For braised beef: Preheat oven to 325 F. Season beef short ribs with salt and pepper. Heat large Dutch oven over medium-high heat. Add vegetable oil and sear beef on both sides, working in batches; remove from pot. 2. Reduce heat to medium; add tomato paste and cook for 2 minutes. Add onions, carrots and celery. Brown slightly then add stout. Reduce heat to low and reduce liquid slightly. 3. Add beef back to pot; add beef stock, thyme and bay leaves. Bring to a simmer; cover and braise in oven until tender, about 30 to 40 minutes. Remove meat from braising liquid and reserve. Strain liquid into saucepan, bring to a boil and whisk in cornstarch to thicken slightly. 4. For potato tots: Heat oven to 350 F. Wash potatoes well with water to remove all dirt. Lightly prick potatoes with fork. Toss potatoes with 4 tablespoons vegetable oil and 2 tablespoons salt. Spread potatoes out on large baking sheet. Roast potatoes until tender, about 1 hour. 5. Remove potatoes from oven and cool to room temperature, about 1 hour. Cut potatoes in half and press flesh through grate into large mixing bowl, leaving skins behind. Discard skins. Season grated potatoes with 2 tablespoons salt and 1 tablespoon black pepper, then fold in 4 tablespoons olive oil. 6. Line half sheet tray with parchment paper and lightly grease with 1 tablespoon vegetable oil. Firmly and evenly press potato mix into sheet tray. Cover with plastic wrap and chill overnight. 7. Cut potato mixture into 1-inch squares. Heat 2 cups vegetable oil in shallow pot to about 325 F. Carefully place potato squares into oil and fry until golden and crispy, flipping as needed and working in small batches so as not to crowd pan. Remove from oil and drain on paper towel-lined plate. 8. For casserole: Preheat broiler to medium-high. Heat braised beef in large saute pan with thickened braising liquid, pearl onions and mushrooms. Once hot, add heavy cream and fold in truffle paste, if desired. Divide mixture between 6 dishes and top each with fried potato tots. Sprinkle Gruyere cheese over top and broil until cheese is melted. Garnish with chives and serve.